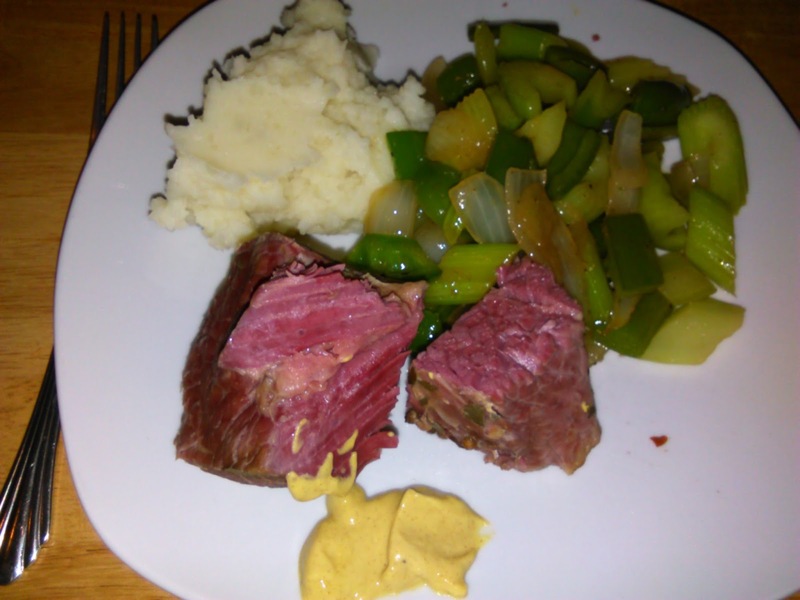 Corned beef from Mitchell's. They make it there and it's almost as good as mine. Be sure to simmer it for 3 hours or it'll be stringy. Mashed potatoes with butter, milk and salt. The vegetables were green pepper, celery and and onion. I cooked them together and sprinkled a little flour over top. Add half a teaspoon of beef stock powder and a quarter cup of water. Toss it around to coat everything and plate. That's Dijon mustard on the plate and the beef was really wonderful. Great flavour, tender. The vegetables were really good. Potatoes, while humble, it wouldn't be a meal without them.